Starewicz initially worked in the nascent forms of documentary cinema and first encountered animation when he utilised the desiccated bodies of specimens to recreate mating rituals for a scientific film. This movement from documentary and entomology to the realm of the “fantastic” and the trick film set the scene for almost all of Starewicz’s subsequent work. Thus, the detail and the actual movements of animals are emphasised in his films, highlighting their similarity to humans but also their utter otherness. Though Starewicz mainly worked with puppets made from such materials as wire and wax, one often gets the sense that his figures are reanimations of the carcases of dead animals (though this is less gruesome than it sounds). This is a very real aspect of a number of his early films which actually use desiccated insects as their central characters (and those later films that actually animate things like skeletons). These films, in particular, appear to be a key influence on the work of the great contemporary British animators the Brothers Quay, as well as providing interesting connections to the painterly animation of moth wings in Stan Brakhage’s Mothlight (1963). (His films also share certain qualities with the patently surreal, and much more natural history focused, work of Jean Painlevé.) The sense of a dead world come to life also highlights the debt that Tim Burton and Henry Selick’s The Nightmare Before Christmas (1993) owes to Starewicz’s films (aside from the more explicit connections to a film like The Mascot). Like many early animated films, Starewicz’s work is often quite explicitly reflexive. This is a quality that is characteristic of such filmmakers as Emile Cohl (who pioneered a number of the techniques Starewicz later used), individual films like the remarkable silhouette animation The Original Movie (Tony Sarg, 1922) – which imaginatively stages the pre-history of cinema in the stone-age era – and Max Fleischer’s Out of the Inkwell series. Nevertheless, such reflexivity is often more integrated into Starewicz’s work and the worlds it creates. For example, the film-within-a-film elements of The Revenge of the Kinematograph Cameraman (1911) are tightly woven into the film’s plot; allowing such remarkable early animation effects as the projection of prior scenes from the film for the insect characters in the penultimate scene, and a beautifully masked image framed surreptitiously through a keyhole. This concern with the medium of cinema extends to Starewicz’s constant references to the world of popular culture that surrounded him (and impinged on the artisanal and solitary studio environment in which he made his films). For example, Love in Black and White (1920) features a stop-motion animation characterisation of Charlie Chaplin. The Mascot (aka Puppet Love) was made during an interesting (and for Starewicz, somewhat frustrating) period in his career. Like many contemporary animators, Starewicz obviously saw the potential for longer forms of animated cinema. During the early sound period he was preoccupied with the production of both longer form shorts and feature production. His subsequent masterpiece, the feature-length The Tale of the Fox/Le Roman de Renard (1931), was in production for 18 months and took over a decade to prepare. (It is also one of the first animated features made anywhere in the world, preceding Disney’s Snow White and the Seven Dwarfs by six years.) The Mascot, made two years later, betrays much of the ambition inspired by this longer work. This is particularly apparent in its detailed deployment of mise en scène and use of such prevalent live-action techniques as back-projection. Like many of Starewicz’s films, it is less successful as a fully-fledged narrative (not a fault of The Tale of the Fox) than as an episodic demonstration of character, animation technique (and its combination with live-action) and visual imagination. Much of the pleasure of The Mascot lies with its attention to details of mise en scène, its focus on animating unlikely objects (such as vegetables and dead chicks half-born in their shell) and the interaction of its characters within particular environments. For example, the party scene of discarded and “dead” objects is grotesquely reminiscent of many representations of the Mexican Day of the Dead. This scene is also clearly referenced in the macabre, re-built toy scene in Toy Story (John Lasseter, 1995). The premise of Starewicz’s film involves toys coming to life after humans have left the scene or drifted off to sleep. This is an unremarkable subject for animation, as it provides a narrative staging of the basic premise or nature of the form itself (of, basically, inanimate things coming to life). Like Toy Story, the human elements are the weakest part of The Mascot, cloaked more within traditions of Victorian melodrama than the modern world that the toys subsequently encounter (in this regard the film is also reminiscent, at times, of Jean Renoir’s The Little Match Girl ). These toy or doll characters are of course given a degree of human agency. They act in a fashion that is in keeping with the stereotypes imparted on them by the humans. 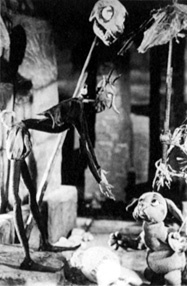 Thus, the central character of the film is Duffy, an expressive, but somewhat worn dog-toy who is brought “to life” by the tear of a child’s (its owner) mother. The dog is then granted a sentiment and loyalty that is singularly lacking in most of the other creations encountered in the film. This may make the film sound ingratiating but, as I have stated above, the basic plot of a Starewicz film is seldom its chief focus. His films generally take a basic situation involving encounter – for example, the country rat who comes to the city to take in the Parisian nightclubs in The Town Rat and the Country Rat (1923) – as a means to create dynamic configurations of a variety of objects and characters (many of the group compositions in The Mascot are remarkable), as well as to place traditional stories (often of East European origin) within contemporary frameworks. Thus, despite often sounding quaint and old-fashioned – a view perhaps reinforced by the insular working methods of stop-motion animation – Starewicz’s films are most commonly about an encounter with modernity. One of the most remarkable scenes in The Mascot involves the toys attempting to breakout of the box that they have been enclosed within for a journey to the toyshop. Other than the character of Duffy – who seems mostly homesick and fulfils the somewhat cloying toy charter (to basically serve humans, to only be animated by them) bandied about by most of the characters in Toy Story – most of the other toys seem to merely want to escape the human realm. The moments that follow them breaking out of their box and wrapping paper, and carving a hole out of the boot of the car they are travelling in, demonstrate the world of difference between Starewicz and Pixar (who subsequently made films like A Bug’s Life  and Finding Nemo ). The scene works on many of the same principles of suspense and action as the later computer-generated films, but the very real danger of the city street is far more palpable (after all, it is a live-action reality). A clown toy launches itself out of the boot only to have his head amputated by the wheel of a car. It is not reattached – a common act in these kinds of films – as we watch the toy’s body crumple into refuse. The immediate fate of Duffy – who stays in the car in order to be resold at the toyshop – is much closer to the gently comic realm of Toy Story; he ends up as a “mascot” dangling from a rear-view mirror. Considering its strong correspondences to more recent films such as The Nightmare Before Christmas and Toy Story, it is not surprising that The Mascot has been one of Starewicz’s most widely seen and distributed films (particularly in the United States). Nevertheless, Starewicz is generally an under-appreciated figure in film, and more specifically, animation history. Until the early 1990s his films were very hard to see (despite early 1980s retrospectives at places like the Edinburgh Film Festival), many of them, including his opus The Tale of the Fox, long thought to be lost forever. In light of the subsequent new Golden Era of feature-film animation, and the critical reappraisal of so much American animation from Warners to Disney (not that far to travel really), it seems time for Starewicz’s work to be more widely appraised (its increased circulation has not led to a great deal of critical analysis). I would argue that Starewicz is a somewhat singular but seminal figure in animation history. Disney’s The Three Little Pigs (1933) is routinely discussed as a breakthrough in character animation – and it is – but Starewicz’s often much earlier films share a number of the same qualities. Starewicz’s often remarkable and unsettling work should make us reassess established wisdoms and histories of film animation.